So you’ve finally made the big decision and have started planning a vacation in the Philippines. That’s great; it’s an amazing place and a country which should be somewhere close to the top of every adventurous traveler’s must go to list. 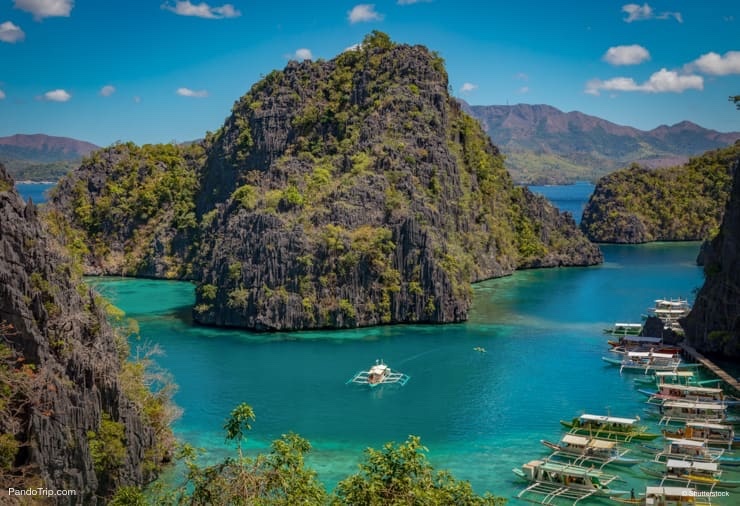 But because of its geographical make-up, it’s an archipelago of over seven thousand five hundred islands covering more than one hundred and twenty thousand square miles, pre-planning your must-sees in the Philippines is a good idea. The Philippines don’t receive as many visitors as the neighboring countries of Thailand and Vietnam, and are nowhere near as touristy either, but tourism to the Philippines is on the increase. While there are areas which are undeveloped commercially, they may not stay that way for very much longer. So now is a great time to go. When you get to the Philippines, forget about visiting Buddhist temples because there aren’t any and the added bonus is, almost everyone speaks English. As a vacation destination, the Philippines are unique. There is literally so much to see and do there, from incredible surfing spots to terraces of rice fields to volcanoes and innumerable beaches, it’s hard to decide just what are the best things to do in the Philippines. Check out these top ten and see if they make it onto your to-do list. Boracay Island is four square miles of land almost completely rimmed by white coral beaches and tropical palm trees. It has always been the number one place to visit in the Philippines, but because of recent developments on the island, it’s slipped down in the rankings to tenth place. 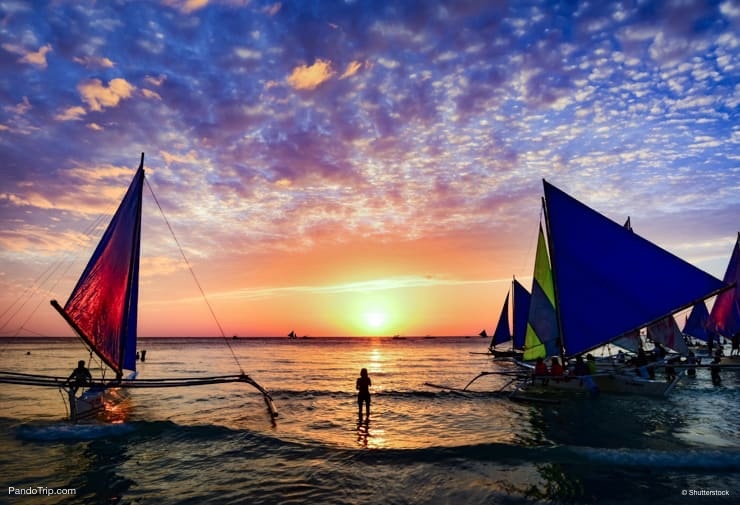 Boracay Island is an idyllic place which has, in the past, attracted more than a third of the visitors arriving in the Philippines to its shores. Too small to cope with the massive influx of visitors, the paradisiacal island began to suffer serious environmental damage and was closed down by the Philippine government for a rest and recuperation period of six months. Boracay Island is set to partially reopen in October 2018 although the number of visitors permitted will be limited. There will be another staged reopening scheduled for April 2019 before the island becomes fully operational again by December 2019. If everything in Boracay Island goes to plan then the closures will have seen major improvements in the previously poor sewage system, no more waste going into the sea which is an excellent environmental move and major roads will have been widened to accommodate traffic more comfortably. Will the works have a knock-on effect? Quite possibly. It could mean a continuation in limited access to the island as well as more expensive stays due to price increases. Boracay Island has always been one of the best places to visit in the Philippines because of its incomparable beaches. The closure of tourism to the island was, in most part, to prevent any more damage to them from the crazy beach parties which were being held. The best beach on Boracay Island? Has to be White Beach, two and a half miles of stunning white sand which curves around the edge of a bay backed by groves of palms and fronted by crystalline waters. White Beach is incredible, but it’s not the only one on the island worth visiting. Don’t miss going to Diniwid Beach, Ilig-Iligan Beach or the Puka Shell Beach, they’re all almost as equally amazing. The nightlife on Boracay Island will no longer be what it used to be. The island’s infamous Ibiza-style beach parties are now prohibited to protect the environment. There is still fun to be had though as indoor parties are allowed, and so are bar-hopping tours. Don’t miss out. Reserve your place on the Boracay Pub Crawls here. Stopping the arrival of people to a popular tourist destination is a major decision, but one which, if it has the desired effect, is more than worth it. As the popular saying goes – take only photos and leave only footprints. By being responsible tourists, we leave a destination in the right conditions for future travelers to enjoy. The moment you arrive in the City of Vigan, its Hispanic heritage becomes apparent. Wide cobbled streets lined with balconied houses and plazas with decorative fountains give the city an old-world atmosphere reminiscent of a sleepy Spanish town during the siesta hours. Vigan is the capital of the Ilocos Sur region on the Philippine island of Luzon. A UNESCO World Heritage Site since 1999 and a New7Wonders since 2015, it is one of the few remaining cities anywhere in the Philippines which has retained its original sixteenth-century charm. The best way to see Vigan is by hiring a traditional kalesa for a slow, horse-drawn carriage ride through the streets. 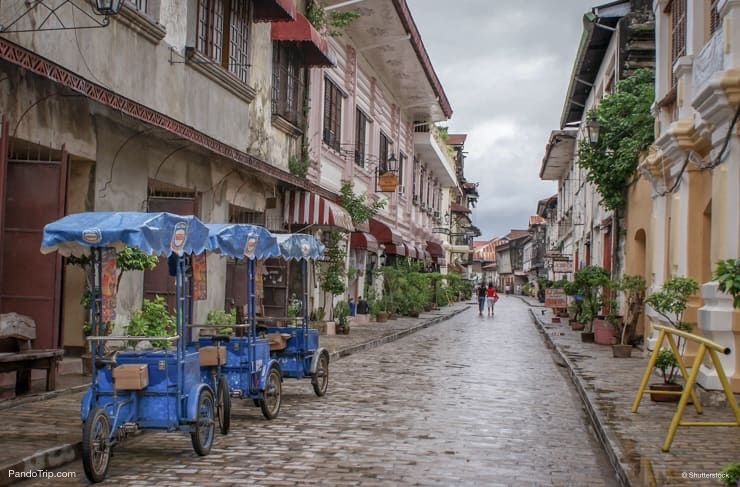 The two-wheeled, canopied caritelas are a favored mode of transport in Vigan, and the clip-clop of hooves on the cobbles adds an extra element to the authentic, and antiquated ambiance of the city. The Mestizo district, or Calle Crisologo, the historic nucleus which constitutes the city’s Spanish character, is a veritable time capsule. The St Paul’s Metropolitan Cathedral, which dates back to the 1800’s, has an ornate Baroque facade, silver-paneled altars, and a separate domed, eighty-foot high bell tower. The Magic Fountain is the stunning centerpiece of the Plaza Salcedo and performs a nightly choreographed show of lights, water, and music. The Hispanic influence in Vigan is noticeable not only in the city’s architecture but also in its cuisine. Don’t miss trying any of these while you’re there. Vigan empanadas are small crispy-crusted pies with various savory fillings. Bagnet, very similar to South America’s chicharon, are small cubes of boiled pork belly which are deep fried until they’re crunchy. Vigan longganisa are short, plump sausages which are spiced with garlic and vinegar then, after being fried in their own fat, are served with rice and eggs for breakfast. If there’s a must-see when you’re in the Philippines, then it has to be the Puerto Princesa Underground River in the province of Palawan. The five-mile-long river is both a UNESCO World Heritage Site and one of the New7Wonders of Nature. The river winds its way through an impressive limestone karst cave system and was thought to be the longest of its kind in the world until the recent discovery of a much larger one near Playa del Carmen in Mexico. Exploring the Puerto Princesa Underground River on a guided tour is a great idea. The well-informed guides navigate you through the National Park and into the river’s cave system on small boats narrating fascinating facts you’d otherwise miss out on. While it’s tempting to take a dip in the crystalline blue-green waters, swimming in the river isn’t permitted so don’t jump in. Puerto Princesa, not just the underground river, is a popular tourist spot in the Philippines, so don’t expect to find yourself alone there or at any of the other of the sights you shouldn’t miss visiting. Honda Bay Island Hopping when you’re in the Philippines is a must do. It’s pure escapism in a paradise location when, on a one day tour you can visit three different islands, Luli, Cowrie and Starfish, which are all overloaded with white sand beaches and some of the best snorkeling on the planet. They may be a twelve-hour boat ride away from Puerto Princesa, but don’t omit the Tubbataha Reefs from your must-see list either. 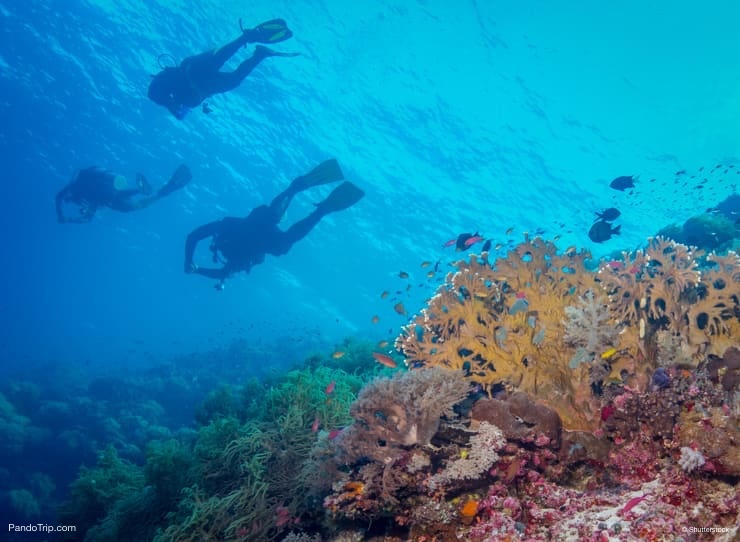 The coral reefs are a UNESCO World Heritage Site, home to thousands of marine species including turtles, mantas and sharks and are one of the top ten dive sites in the world. Probably the best word to describe Manila, the capital city of the Philippines, is chaotic, but it’s an exciting chaos. Manila is such an interesting and diverse city, it doesn’t deserve the downtrodden reputation it’s sometimes credited with. Expect to find the country’s best museums there as well as theaters and auditoriums showcasing performances from first class artists in all the genres plus some amazing nightclubs and bars. Manila really does come to life after dark. The city of Manila carries the nickname, Pearl of the Orient and as with all pearls, you need to break through the shell to discover the treasure hidden inside. That can be difficult as Manila has no discernable center, but explore each district individually and like a flower unfolding, Manila will reveal its secrets. Literally translated to English, Intramuros means inside walls, and the Intramuros district of Manila is exactly that. The walled, old-Spanish quarter of Manila covers just half a square mile so is easy and fun to explore on foot. The elaborate houses lining the wide streets are reminiscent of Havana in Cuba, and the laid-back atmosphere is similar too. Find your own way around Intramuros or the Walk This Way Intramuros Tour with Carlos Celdran comes highly recommended. He’s entertaining as well as being very informed about the area, Manila and the Philippine culture. If you’re thinking of making Manila your base while in the Philippines, then Intramuros, along with Ermita and Malate are great places to stay. If there’s too much hustle and bustle for you in Manila, then head to Makati which is one of the sixteen cities within the metropolitan area of Manila. In what is Manila’s designated financial district, order reigns. Nestled among the tower blocks of banking institutions, foreign embassies and the country’s stock exchange, are big department stores, restaurants and some of the liveliest nightlife in the Philippines. So if the city buzz is too chaotic for you, Makati is maybe the best place to stay in Manila. Visit a Museum: Manila is home to some of the best and most diverse museums in the Philippines. While you may not have time to visit them all, these are the ones you really shouldn’t miss. The National Museum of the Philippines which exhibits everything from fine art to archeology. The Ayala Museum which focuses on indigenous art and artifacts. The Mind Museum which is all about science and has over two-hundred and fifty interactive exhibitions. If you have a sweet tooth, then the Dessert Museum is a must see in Manila. It’s a real, live version of a Willy Wonka chocolate factory with lots of sugary treats to sample. Nightlife: Manila is one of the best places in the Philippines for amazing nightlife. From pricey sophisticated pubs in Makati to more economical bars in Malate or Ermita. In Manila, there is something to suit everyone’s taste. Check out this great guide on Manila’s nightlife to discover what suits you and where to find it. Attractions: One of the most popular attractions in Manila is Manila Ocean Park. The marine theme park has aquarium tunnels, ray and shark encounters and a walk-through frozen continent with live penguins. Shopping: Shopping in Manila is an experience all in itself. The SM Mall of Asia is Manila’s super-mall, the fourth largest in the Philippines and has more retail outlets than you can visit in a day. For a more varied shopping spree, try a Manila Shopping Experience Tour which includes the SM Mall as well as Greenhills and Divisoria which are more traditional and where you’ll need to put your bartering skills to the test. The Philippines, with twenty-five active volcanoes, is the ideal country for volcano tourism. The Mayon Volcano, as well as being an almost near perfect classical cone shape, is one of the most amazing volcanoes in the world. It is also one of the most active and can be dangerous so if visiting it is on your wishlist, check its current eruption status here before going. When the Mayon Volcano is taking a rest from spewing lava, it is possible to trek up it, though you’ll need to be prepared as it’s not an easy climb. There are four camps along the hiking path. Basecamp, camp one, camp two and the final one, the crater itself. Making it as far as the second camp takes on average around three hours. Going any further up is not advisable unless you’re a seasoned volcano climber, have the right equipment and are accompanied by a trained guide who knows the terrain. NB: Before setting out to climb Mount Mayon, you will need to contact the Department of Tourism Office Regional V in the city of Legazpi. The best place to view the Mayon Volcano, and the one which requires the least strenuous effort, is from a window seat in an airplane. 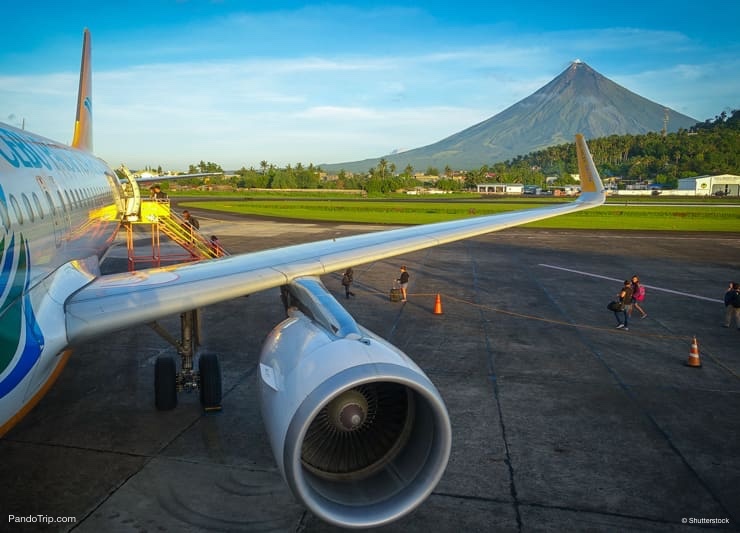 If you’re flying into Legazpi, ask to be seated on the left side of the plane to see the volcano in all its majesty or when flying out of the city, sit next to a window on the right-hand side. There are also great views of the volcano from the airport itself. 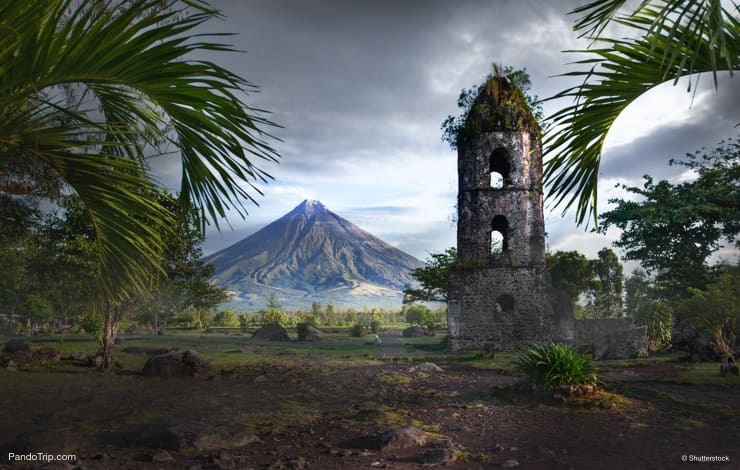 Another option is to visit the Cagsawa Ruins, a sixteenth-century church tower in the Daraga municipality of Albay, from where the vistas of the temperamental mountain are uninterrupted and incredible. The easiest and most fun way to get to the ruins is to hire an AT quad-bike or vehicle here and then drive there. Mount Mayon isn’t the only volcano in the Philippines worth seeing or climbing. Check out the Taal Volcano which is the world’s smallest active volcano and located just outside of Manila or take a day trip out of the city to Mount Pinatubo, a volcano famous for making the twentieth century’s second largest eruption. It’s also possible, though definitely not easy, to climb Mount Apo, the highest peak in the Philippines. 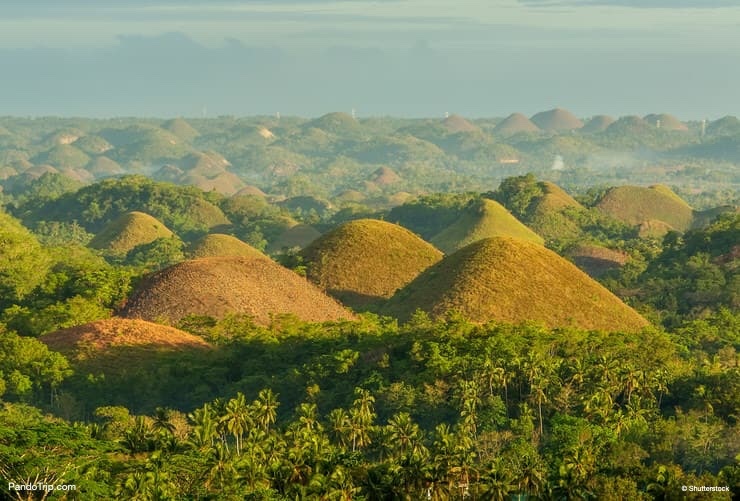 The Chocolate Hills in the province of Bohol is a natural geological phenomenon of which there are few examples in the world and a definite must-see when in the Philippines. In this very unusual landscape, and in an area of just over thirty square miles, there is mound after mound of karst hills. The cone-shaped bumps, some over a hundred and fifty feet high, blanket the ground wherever you look. The number of hills has never been ascertained, but is well over a thousand and could be closer to two. Covered in grass during the wet season, when the climate changes and the grass dries out, the hills take on a distinct dark brown coloration from which they take their name. 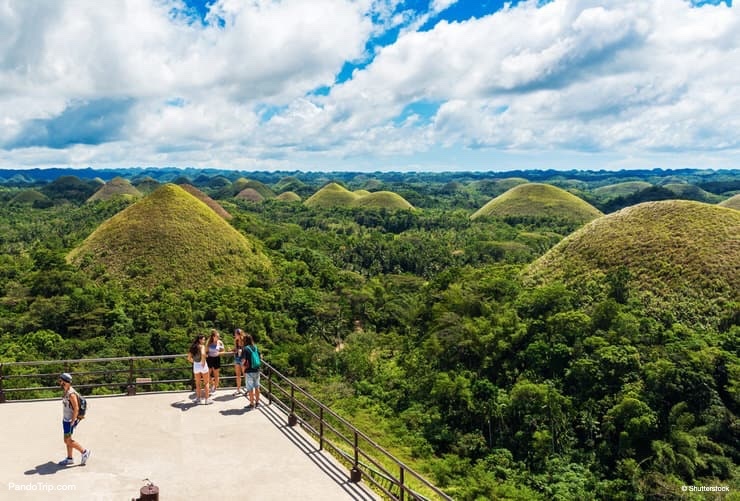 To be able to see the entirety of the Chocolate Hills and truly appreciate their splendor, the two best places to view them from are the Chocolate Hills Complex or Sagbayan Park. The Complex is about three miles outside of the town of Carmen and has a 360° viewing platform with superb panoramic vistas of the hills. The views are amazing from the Complex, but be ready to join the crowds climbing the two hundred steps before you finally see them. Sagbayan Park is a quieter, less touristy alternative and more convenient transport-wise when staying on the north-eastern side of Bohol. 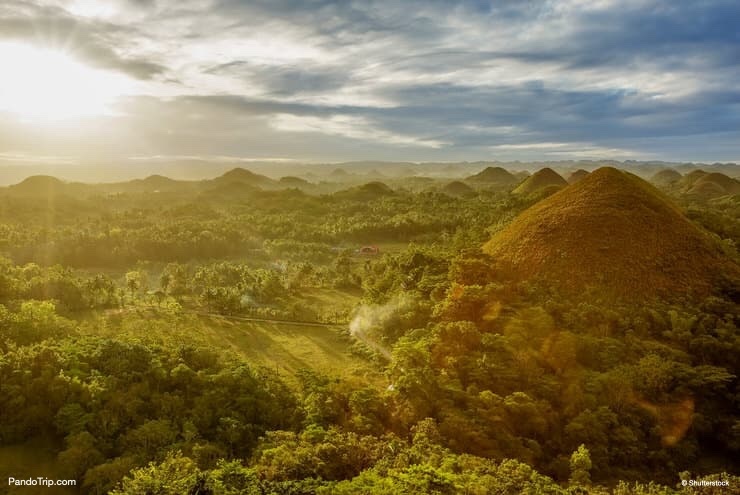 The Chocolate Hills are an impressive sight any time of the year but even more so when they’ve turned entirely brown. That happens during the dry season which runs from late November through to May. Seeing Tarsiers is a must-do when you’re in and around Bohol, though make sure you do it the right way. These tiny, bug-eyed, long-fingered mammals are one of the smallest primates in the world. Yes, they’re cute, but they’re not pets and are bordering on being an endangered species just because of human interest in exploiting them. Refuse any offers of private viewings and visit the Philippine Tarsier and Wildlife Sanctuary, rather than the Tarsier Conservation Area, that way you’ll really be helping conservation efforts to maintain the species. Siargao is a tear-shaped island, two-hundred and seventy miles southeast of Manila, which takes the meaning of paradisiacal to a whole new level and even more so if you’re a surfer. The Philippines are a surfer’s paradise with countless beaches receiving world-class waves in many spots around the archipelagos twenty-two thousand plus miles of coastline. But the best is Siargao, the capital of surfing in the Philippines and also possibly the best surf spot anywhere in Asia. Siargao’s most popular spot for catching big waves is in the island’s municipality of General Luna. Dubbed Cloud 9, because of its ninth-place position in the world’s best surf spot rankings by CNN, the swells and peaks produced there are not for novice surfers. Watching surfers ride the Cloud 9 waves is an unforgettable experience and a great way of picking up tips to improve your own surfing skills. You don’t need to be a professional to surf in Siargao. There are some great surf spots perfect for beginners too such as Jacking Horse, Daku, and Guiuan. Take a look at this guide to surfing on Siargao Island to find out more about them. Siargao has fantastic waves all year round, but during the monsoon period, between November through to February, is when the world-class waves really start rolling in though they can often be accompanied by rain. If you can manage to drag yourself away from the beach and the crash of the waves, then take time to visit the Sugba Lagoon. The lagoon is hidden away on the remote island of Del Carmen which is around an hour’s boat ride from Siargao. 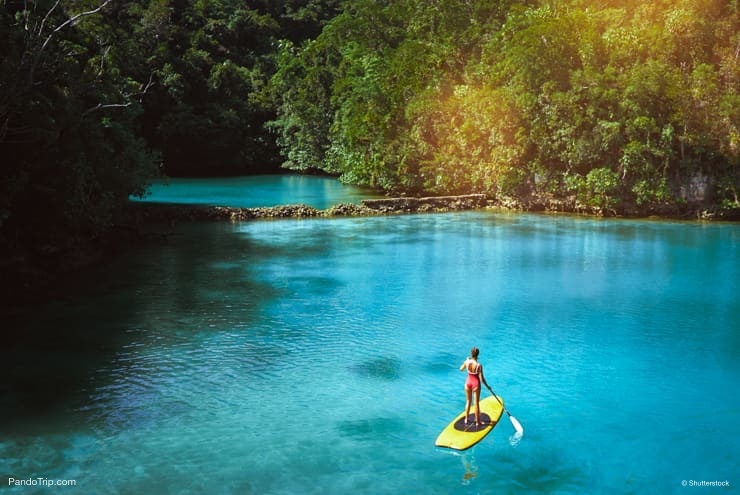 Apart from being spectacular to see, the lagoon has green-blue waters surrounded by rainforest and it’s a fantastic place for snorkeling or SUP paddleboarding. 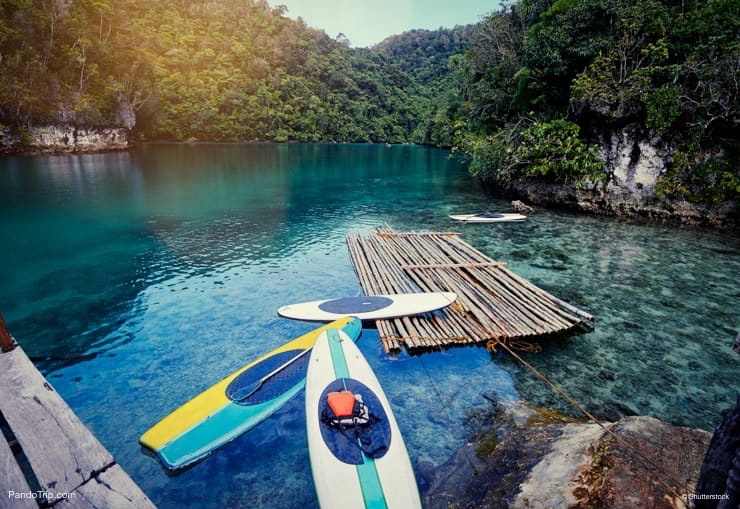 If you can’t make it too Siargao to surf then try some of these alternative places instead. Baler in the Aurora province is an excellent second choice and is reputed to be the birthplace of surfing in the Philippines. San Juan, in La Union, is about a four-hour drive from Manila and offers great waves twelve months of the year. While the beaches may not be as vast as those in other parts of the Philippines, San Antonio in the Zambales municipality is a popular surf spot for locals and tourists alike. The Batanes Islands are the most northern in the Philippines and are the same distance from Taiwan as they are from Manila. The mini-archipelago is made up of ten individual islands only three of which, Sabtang, Batan and Itbayat, are inhabited. What makes these islands standout from many others are their landscapes and their culture which is virtually crime free. While they are well worth visiting, they’re not the easiest or most economical to get too, and the island’s tropical climate often plays havoc with flight schedules. Plan to visit the Batanes Islands from March to May which is the dry season and when there is less likelihood of encountering typhoons. 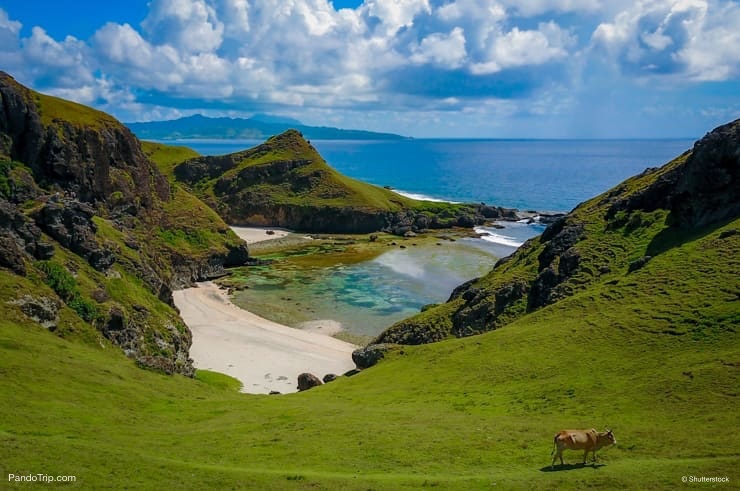 The Batanes Islands are one of the best places in the Philippines for chill out beach time. Chadpidan Beach is not a typical stretch of white Philippine sand, but rather a beach strewn with boulders from a volcanic eruption of Mt Iraya several centuries ago. While it might not be ideal for sunbathing, it’s a fantastic spot to watch a Batan Island sunset. Nakabuang, or Morang Beach as it’s also known, is on the island of Sabtang and is a glorious stretch of golden sand adorned with several outstanding rock formations including a plant-covered limestone arch. It is stunningly scenic. The east-facing Valugan Beach may be a boulder covered stretch of coastline, but it is still one of the top beaches in the Batanes for watching the sunrise. Wear decent footwear when visiting both Chadpidan and Valugan or you could end up twisting an ankle clambering over the rocks. 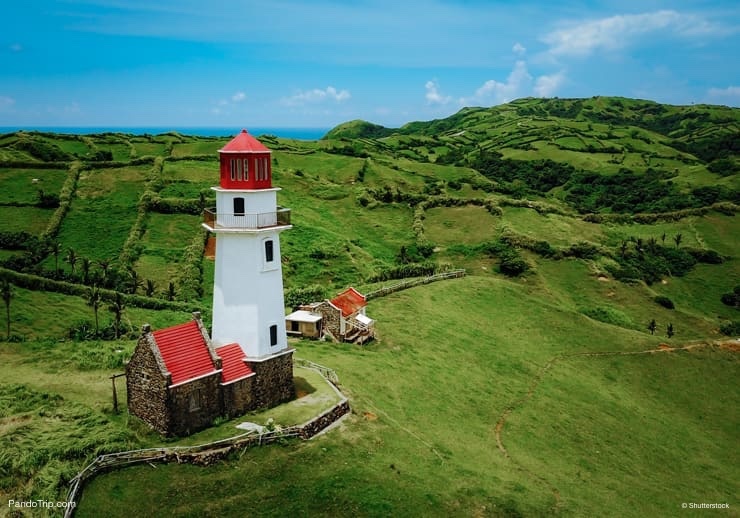 The Batanes Islands are a fascinating place for history lovers. 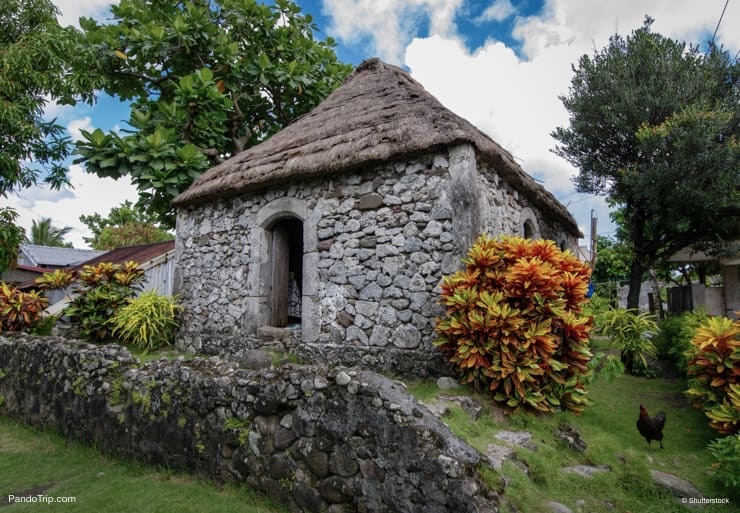 Lack of building materials meant the island inhabitants made use of what was at hand to construct their dwellings and so stone houses with thatch roofs, inspired by techniques learned from Spanish invaders, were common. Now the most remaining examples of the stone houses are distributed between the islands of Sabtang and Itbayat. Life goes on as it has for centuries in the Diura Fishing Village where the catch of the day is the most important event. The village is tucked away in a small cove lined with stilt houses and a beach where the colorful fishing boats are laid to rest after a day on the ocean. It’s a primitive, but restful place. Don’t miss out on trying some of the island cuisine while there like Uved, a savory meatball, and Dibang, a local delicacy of flying fish cured with vinegar and very similar to ceviche. The scenery in the Batanes Islands is incredible. Think rolling green hills that you’d more likely expect to see in a country like England or Ireland than on a Philippine island. Some of the most impressive, the Vayang Rolling Hills, the Naidi Hills and the Mahatao Hills plus the Rakuh-a-Payaman, often called Marlboro country, are all located on Baten Island, so touring around comes highly recommended. There’s a world famous cafe in the Philippines, no it’s not Starbucks, but it is in keeping with the Batanes Island no-crime culture. The Honesty Coffee Shop is a rustic, thatched-roof shack in Ivano which is totally self-service. Choose want you want, then write down what you’ve taken in the log book and put the payment in the cash box. Leave the right amount, there’s no one there to hand out change, or you can always leave any extra as a tip. Whatever you do, don’t leave without paying, or it’ll be your honesty in question. When you think of rice terraces, the first country which comes to mind will probably be China. Think again, because the Banaue Rice Terraces in the Philippine province of Ifugao are classed by many as the eighth wonder of the world. The rice terraces were constructed more than two thousand years ago by the indigenous inhabitants of Luzon and rise, tier upon tier, up the mountain sides to a staggering five-thousand feet. Which, considering there was no agricultural machinery in that era, and the terraces were constructed by hand, is an incredible feat. The Banaue terraces are part of the extensive spread of Ifugao rice paddies which also include similar fields at Batad, Bangaan, Mayoyao, Kiangan, and Hungduan and a must-see when in the Philippines. On the road up to the Banaue Rice terraces there are a total of four viewpoints spread out at quarter mile intervals. Rather than hiking up, hire a tricycle, they cost around 200P (Philippine pesos) for the return journey. Along the way, gathered at the viewing points, you’ll encounter native Ifugao and Bontoc women dressed in traditional costume, who for a small fee of 20P will permit their photograph to be taken. Explore the Ifugao rice fields more by heading to the terraces at Batad. They are the most impressive of all though not the easiest to get to. It takes an hour to get from Banaue to Batad, and there is some walking involved. Put your hiking boots on because there are some great treks in and around the Batad rice terraces which you’ll want to experience when you’re there. The Tappiya Falls is a magnificent, two-hundred-foot high waterfall hidden among the rice terraces which cascades down a gorge into a rocky lagoon. The falls are about one hour’s walk from Batad village and a definite must-do if you’re visiting the rice terraces. While the Banaue rice terraces are amazing to see at any time of the year, they’re at their best a month or two before harvest time when the rice plants are a vibrant green, before they slowly ripen and turn golden as the season progresses. The best time to go is from June to July or alternatively from February to March when it’s planting time. 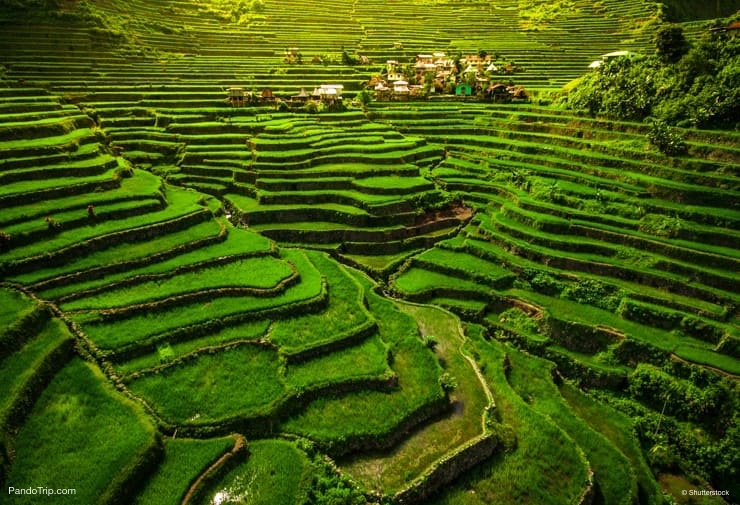 The Batad rice paddies are planted twice a year and usually at their greenest from April to May or from October to November, but as with all agricultural crops, a lot depends on the weather and the world’s ever-changing climatic conditions. If you’ve made it as far as Palawan Island in the Philippines and have seen the underground river plus all the sights of the island’s capital, Puerto Princesa, you may feel it’s time to hit the beach and take time out. While the municipality of El Nido in the north of Palawan island is a popular choice and convenient to reach for many visitors to the region, there is another option which has all the same features as El Nido but is much less crowded, and that’s Coron. While it’s true that El Nido is just a few hours road trip from Puerto Princesa, it comes highly recommended to take a look around there, then jump on a ferry to Coron. In almost the same amount of time it takes to drive from Puerto Princessa to El Nido, you’ll find yourself in an incomparable paradise of lagoons, pristine white beaches and weathered limestone landscapes plus less tourism to contend with which is why Coron is number one on this list. If you’re not touring around but having a single destination break, fly into Busuanga and Coron is a one hour boat ride away. 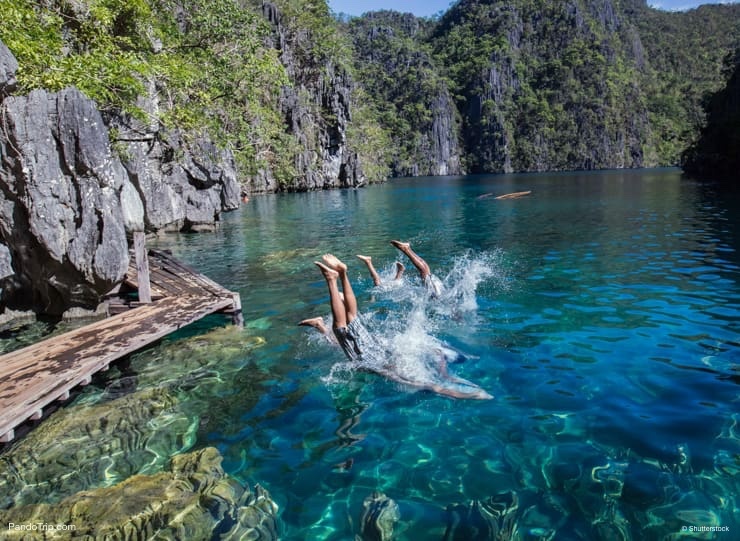 Kayangan Lake is a hidden natural treasure on Coron Island. Surrounded by high cliffs and thick foliage, the lagoon-like lake is reputed to be one of the cleanest not just in the Philippines but in all of Asia. Take a leisurely swim or ride on a bamboo raft across the crystal clear water before climbing up to the viewpoint to snap off a few shots of Coron Bay. Twin Lagoon on Coron Island is a quirk of nature in that it has both fresh and saltwater. It’s also a spot where the underwater scenery is as incredible as on the surface so make sure to take a snorkel and mask. The first lagoon of the pair is only accessible by boat and entering the second depends on the tidal conditions on the day. If there’s a low tide, the second lagoon can be reached through a swimmable crevice in the rocks. If the tide is up, then you’ll need to climb a ladder to get to it. Getting in, whichever way you do it, will give you the sensation of entering into another world. Mount Tapyas is seven hundred foot high mountain on Coron Island worth climbing to see the fantastic panoramic views of Coron, the ocean and the neighboring islands from the summit. If you can’t make it as far as Coron either for time or budget reasons, you’ll still have a great time in El Nido and Puerto Princesa. If you do want to see more, then both Port Barton and San Vicente are great, or for an alternative to Palawan, it has to be Cebu. Wherever you go in the Philippines, you’ll have an amazing vacation. Maligayang paglipad! Visas: Most nationalities do not require a visa for stays less than 30 days. Money: ATM’s are widely available. Credit/Debit cards are accepted in most places. Internet: Many hotels and cafes have free WIFI although the connections aren’t reliable. For guaranteed connectivity hire a 4G pocket WIFI device or 4G internet SIM card. Travel Insurance: Travel insurance is not a requirement but highly recommended if you’re planning on hiking, diving or surfing. 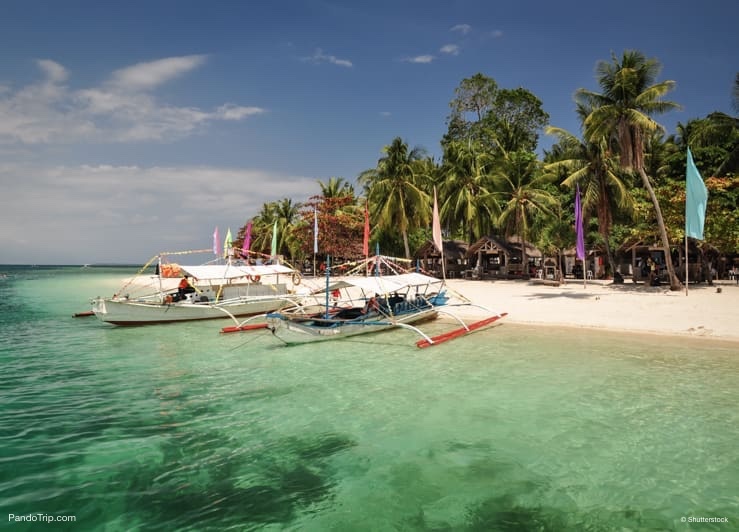 World Nomads offer first class insurance coverage for the Philippines – check it out here.